Burns met Green when he was 88 years old, and spent the next several years recording his oral history, conversing with his extended community, and researching broader political questions relevant to his long 20th century life. 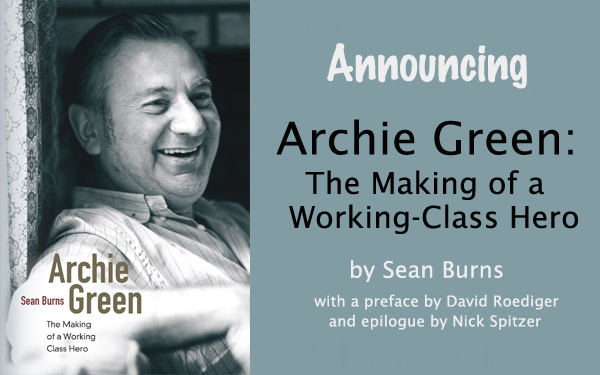 HISC alumnus Sean Burns's book, "ARCHIE GREEN : The Making of a Working-Class Hero", has been awarded the CLR James Award for Best Book of 2011 by the Working Class History Association. "An accessible, exceptionally researched biography which manages to offer both appreciation and critique and to capture the very complex political and intellectual sources of Green's energy and ideas. This would also honor Green, probably the greatest practitioner of working class studies in our lifetimes." "Wide-ranging, nuanced, and well-written, and generally avoids hagiography." Archie Green: The Making of a Working-Class Hero celebrates one of the most revered folklorists and labor historians of the twentieth century. 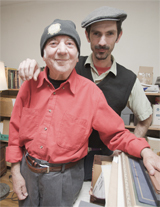 Devoted to understanding the diverse cultural customs of working people, Archie Green (1917–2009) tirelessly documented these traditions and educated the public about the place of workers' culture and music in American life. Doggedly lobbying Congress for support of the American Folklife Preservation Act of 1976, Green helped establish the American Folklife Center at the Library of Congress. This significant national center for folklife preservation has undertaken a variety of projects including concert series, recordings, oral histories, and the Archive of Folk Culture, a vast collection of images, recordings, and written accounts that preserve the myriad cultural productions of Americans. Capturing the many dimensions of Green's remarkably influential life and work, Sean Burns draws on extensive interviews with Green and his many collaborators to examine the intersections of radicalism, folklore, labor history, and worker culture with Green’s work. Burns closely analyzes Green's political genealogy and activist trajectory while illustrating how he worked to open up an independent political space on the American Left that was defined by an unwavering commitment to cultural pluralism. This book includes a foreword by historian David Roediger and a final interview with Green, conducted by folklorist and media commentator Nick Spitzer.